The excitement about the HAP Tour is spreading… all the way to Virginia! Stephanie Weber, Regional Network Manager at the Safe Routes to School National Partnership, will be riding along with the HAP Team by logging miles in her own community during the week of the Tour. We’re thrilled to have Steph’s virtual support, and welcome you to virtually ride along with us too! One of the first questions I asked upon being hired by the California Highway Patrol in 1991 was if they had showers that I could use after I rode my bike to work. I was a student at UC Davis, and I had just been hired to work in the CHP’s Office of Public Affairs at the headquarters in Sacramento. My new employers clearly did not expect this question, but it seemed an obvious one to me. I’d grown up in Colorado and in the Bay Area riding my bike everywhere, and I was attending college in the nation’s bike capital. I wasn’t a bicycle advocate by any means. It’s just something I did. Fast forward a couple of decades, and I am very much entrenched in advocating for active transportation. Now I just happen to live on the other side of the country. I feel fortunate that I can work with so many great folks in California though, and that is why I’m excited to join in the upcoming Healthy Active Places Tour to raise awareness of the fact that we still have a long way to go before all of us — particularly our children — are easily and safely able to walk or ride our bicycle everywhere. Even though I can’t be in California, my 12-year-old daughter and I pledge to bicycle to her school during the whole week of the HAP tour. It’s a four-mile trip one way, so my daughter will be riding 8 miles a day, and I’ll ride a minimum of 16 miles. Part of our route travels down the main street of Colonial Williamsburg, so instead of traveling alongside automobiles, we dodge ox carts, carriages and interpreters dressed in Colonial garb. While it’s not quite the same as the rural roads of the Central Valley, it’s scenic nonetheless. We encourage to support the HAP tour, too! Ride, pledge or both as we work to make riding a bicycle something we can all take for granted! ← Itinerary overview – the week is shaping up! This is very cool. I reposted. 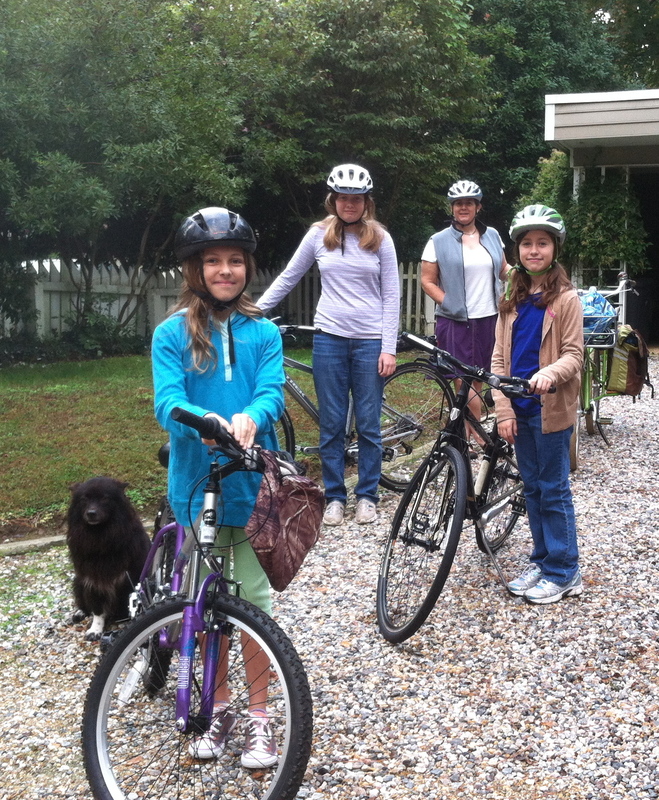 It would be great to have families all over the US to ride with us.